Qosina offers a variety of drain valves that are in stock and ready for immediate delivery. Made of PVC and HDPE, this in-line, T-style valve has a white actuator that slides open to allow for the free flow of fluid. Qosina part # 14007 has a 0.287 inch ID x 0.363 inch OD tubing port and is ideal for applications that require the need for quick drainage or decanting. Qosina offers a variety of tubing options to complement our line of drain valves. Qosina offers a variety of drain valves that are in stock and ready for immediate delivery. Made of PVC and LDPE, this in-line style valve is designed to be placed at the end of a tube. 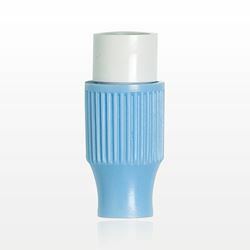 The light blue twist control opens the valve, allowing for the free flow of fluid. Qosina part # 80041 can accommodate a 3/8 inch OD tube and is ideal for applications that require the need for quick drainage or decanting. Qosina offers a variety of tubing options to complement our line of drain valves. Qosina offers a variety of drain valves that are in stock and ready for immediate delivery. Made of PVC and ABS, this in-line valve has a blue handle that when turned, allows for the free flow of fluid. Qosina part # 14006 accomodates 0.315 inch ID tubing and is ideal for applications that require the need for quick drainage or decanting. Qosina offers a variety of tubing options to complement our line of drain valves.